International law won’t stop big countries from bullying littler ones. 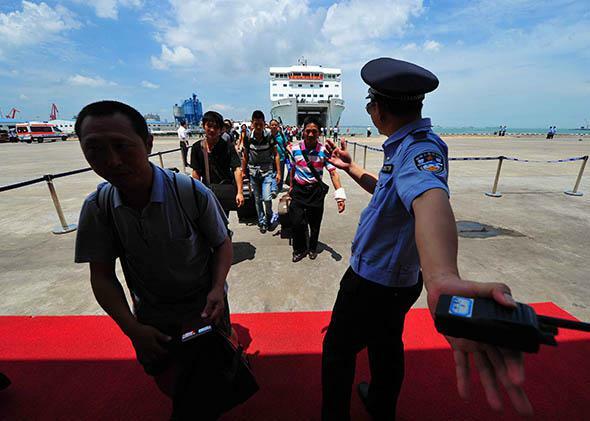 Chinese nationals disembark from the passenger vessel Wuzhishan on May 20 after encountering protests over a Chinese oil rig in waters Vietnam claims as its own. The South China Sea looks like a tongue hanging down from the Chinese mainland to its north. Vietnam lies to the west, Malaysia to the south, the Philippines and Taiwan to the east. Rocks, shoals, reefs, and islands dot the sea. Fisheries abound, oil gurgles beneath the seabed. The countries that line its coasts all hunger for these resources. But they disagree over who owns what. Lately the temperature is rising in these decades-old conflicts. Last week, Vietnam signaled that it might join the Philippines in a legal action against China. Vietnam wants to stop China from exploring for oil in a part of the South China Sea that Vietnam claims for itself, while the Philippines is smarting over China’s eviction of Philippine fishermen from traditional fishing grounds back in 2012. Both Vietnam and the Philippines have strong claims, and so it might seem reasonable for them to seek arbitration. But a tribunal can’t stop China from bullying its neighbors. The countries can halt Chinese expansion into the South China Sea only if the United States backs them up, and it is unlikely that the United States will. Over the long run, it can’t. The major flash points begin with the Paracel Islands in the northwest, where China and Vietnam clashed over an oil rig that China sent for exploration. When Vietnamese vessels tried to stop the rig from entering Vietnamese waters, Chinese ships allegedly rammed the Vietnamese ships and blasted them with water cannons. On Monday, a Vietnamese fishing boat sank after being rammed by a Chinese vessel (according to Hanoi) or trying to ram a Chinese vessel (according to Beijing). In the Spratly Islands in the southeast, where China, Malaysia, Taiwan, Brunei, Vietnam, and the Philippines all vie for control, Chinese vessels fired upon Vietnamese commercial ships in 2011. And China kicked Philippine fishing vessels out of the waters surrounding the Scarborough Shoal in the east. Chinese aggression has stoked nationalist resentments in all these countries, especially in Vietnam, where anti-China riots recently broke out. China’s “nine-dash” claim of South China Sea territory, in green. Under the U.N. Convention on the Law of the Sea, countries are entitled to marine resources that lie within 200 nautical miles of their coastline or islands they own (in an area called the Exclusive Economic Zone). They also own mineral rights in the continental shelf that juts out from their territories. The smaller countries mostly follow these rules. China, by contrast, ignores them to claim nearly the entire South China Sea. In 2009, the Chinese government filed a map of the South China Sea region with the UN. The map displayed a line, composed of nine dashes that followed the sea’s outline all the way around, leaving only a thin band of water for China’s neighbors along their respective coasts. 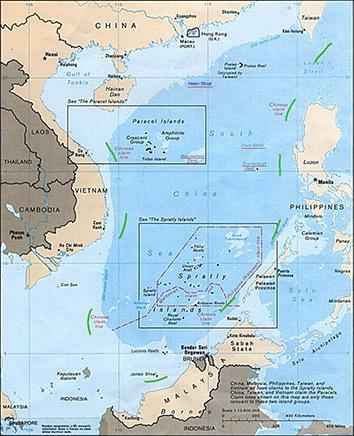 This nine-dash line, as it came to be called, suggested that China claimed the marine resources in nearly the entire South China Sea. The map above shows the extraordinary scale of China’s claim. China has never offered an official legal justification for the nine-dash line. Robert Kaplan, in his new book Asia’s Cauldron, quotes a high-level official of one of the neighboring states: “The Chinese never give any legal justifications for their claims. They have a real Middle Kingdom mentality, and are dead set against taking these disputes to court.” But China has hinted that its claims are blessed by “history.” This seems to mean that China owns these resources because various Chinese governments in the distant past regarded all the islands in the South China Sea, and maybe the sea itself, as a part of its imperium. The argument echoes the Chinese position in its fight with Japan over the Senkaku/Diaoyu Islands in the north. As I’ve explained, international law does not accept China’s argument—one must occupy an island in order to own it. Countries, like people, can’t take ownership of something just by saying so. The Law of the Sea Treaty limits China to 200 nautical miles plus its continental shelf just like everyone else. China may be willing to compromise, or it may not—hard to know, since all the country will officially say is that the countries disagree, and these disagreements should be worked out over time. This sounds like an effort to be reasonable, but it’s really just a tactic. Time is on China’s side. The county is just too damn big, and getting bigger all the time. China’s economy has grown much faster than those of Vietnam, the Philippines, Malaysia, and the other countries, and will continue to do so for the foreseeable future. China’s neighbors are becoming ever more dependent on China for trade and investment. They need China more than China needs them, and China is building a navy they cannot match. When a bully threatens the cowpokes, it’s time to call in the sheriff. The Philippines and Vietnam hope to use the arbitration procedure established under the Law of the Sea Treaty to force China’s hand. If the arbitrators rule against China, this might dampen China’s argument that the legal disagreements are too complicated to resolve anytime soon. But China has refused to participate in the arbitration and will disregard any judgment against it. And that will be that. The judges can no more compel China to yield the Spratlys or Paracels than they could detach those islands from the seabed and tow them away. China’s neighbors hope that if they build a strong legal case, the United States will use force to repel a China takeover. But that won’t happen. The U.S. navy is bigger than China’s, but it patrols the globe, while China’s can focus on the swimming pool in its backyard. Do we really care whether a Vietnamese oil company or a Chinese oil company extracts oil from the seabed around the Paracels and sells it on the global market? Or whether poor Philippine fishermen or poor Chinese fisherman get to catch fish off Scarborough Shoal? Not nearly enough to go to fight with China over a rock or reef in the middle of the ocean—as China seems to be betting. Just as we are learning that we can live with a Ukraine that lies within the orbit of Russia, we will need to learn that we can live with a Chinese sphere of influence in the South China Sea. This may seem to be hard on the countries that are being bullied. Some commentators warn of “Finlandization”: Finland accommodated itself to the Russian bear during the Cold War by turning inward and adopting foreign policies that the superpower could live with. Now it’s the South China Sea countries that must yield to the Chinese dragon. But the fact is that most countries are Finlandized. Canada and Mexico, in the sense that they must accommodate themselves to U.S. foreign policy. Ukraine is Finlandizing itself to Russia as we speak. As long as China allows its neighbors to govern themselves, and doesn’t try to conquer them—and there is no reason to believe Beijing wants to go that far—the United States should leave it alone in the South China Sea.